I am glad to say that I am nearing the end of creating the tome called, Enchanting Recipes Of The Past (see last blog entry). The tome contains over 50 pages of information, but thanks to the easy to use "Contents" system that works with my ReadBooks add-on, every crafting recipe is easy to locate and follow. I only have three sections left to do: Grenades, Venoms & Special. I also took the opportunity to update the ReadBook code to now close the "Contents" section automatically after closing the book. Therefore, this line in the conversation will be removed for all books contents displays now. The problem was that when the code went to check for the necklace required (written in the wrong case in the 2da file), it did not find it in my inventory and ended up giving me another necklace in its place! This went on every time I tried the recipe, which also means it is an exploit in the game itself. Before finishing the tome, I also started to check the code behind the Molds that PCs can use to build weapons and armour. Again, I have tried to simplify the usage of these items by explaining the mechanics behind their use and giving extra information in the exotic materials descriptions where applicable to make the crafting easier for the player. 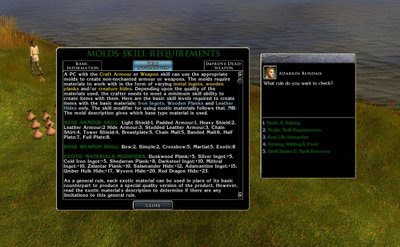 To accompany this, I also added more in-game information for the player to help them recognise what they need to have in the way of skills to be able to craft items from molds in the first place. Check out the screenshot to see how the information is easily found from the player's unique Main Menu. Like all things I am trying to set out for in this module, I am hoping to make the more specialised areas of game-play more accessible to the average player. From my own experience, I have found certain aspects of crafting rather complicated to use, and that it often took more time and trouble to do than it was worth. However, by making the value of crafted items more valuable to the PC (and player) and at the same time easier to understand, then I hope that crafting will take a more enjoyable and prominent place in the campaign than it would have done otherwise.